Submerged plants are also called oxygenators. They provide oxygen during the day but actually use oxygen at night. For information on aquarium plants and more information on anacharis, hornwort, valisneria, etc., see my Aquarium Plant Page and Aquarium Plant Species Page. Submerged plants are those that grow completely under water with the exception of occasional flowers that top the surface. Anacharis has small white flowers with yellow centers that exit the water. Submerged plants sometimes need to be anchored in dirt or gravel but can also sometimes float free under water depending on the species (hornwort does well free). Even if planted, goldfish and koi often uproot and eat them. 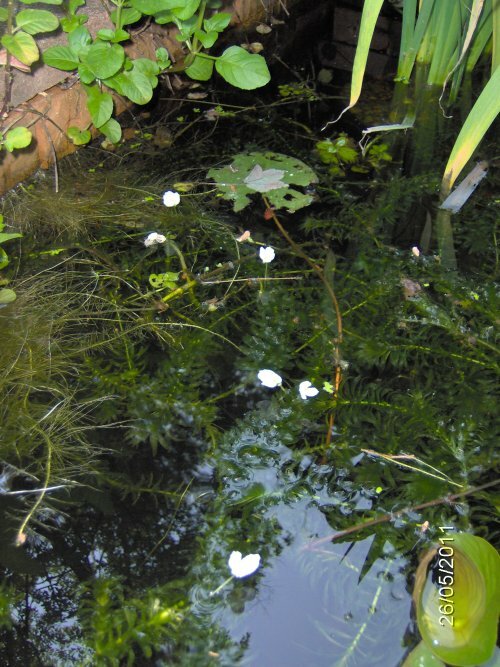 Most submerged plants obtain the majority of their nutrients through roots in the water column and not as much from the dirt or anchoring area on the pond bottom. Thus, they should not be fertilized and are well known for removing excess nutrients (ammonia, nitrate, phosphate, etc.) from the water. This can reduce the quantity of competing algae. Submerged plants can have a tough time surviving in hobbyist ponds due to the often reduced clarity of the water due to algae blooms as well as the propensity of most pond fish (koi and goldfish) to eat their leaves. The best submerged plants, like anacharis (the first submerged plant my fish eat), cabomba, foxtail, and hornwort (the last submerged plant my fish eat), are all devoured by my fish to almost nothing. Special mesh covers can be attached to submerged plant pots to keep fish from disturbing them. Beware that submerged plants protectors can also trap and kill fish and frogs as mine did (I removed them after a few years). Submerged plants are also called oxygenators. They provide oxygen during the day but actually use oxygen at night. With the day/night cycle, too many submerged plants can not only alter the oxygen levels but change the pH as well. For information on pH and oxygen swings resulting from submerged plants, see this section. Most submerged plants can be propagated by cuttings. There is a lot of confusion on the species of anacharis, valisneria, etc. because some suppliers only say anacharis and not which species, call it just pond weed, or any other number of made-up names. Often, a scientific name is given but it is spelled wrong or actually totally wrong. There is no consistency. To make matters worse, even if you can find a good book to identify which species you obtained, it is often nearly impossible to see the physical differences between two similar species, or sometimes the book is wrong too! The main physical differences are that Elodea canadensis has smaller leaves and grows only a few feet while Elodea densa grows up to 9 feet and has larger leaves. Elodea densa is what is usually sold as anacharis, and it is prohibited in some areas whereas Elodea canadensis usually is not. Elodea densa or Egeria , which is the anacharis that I have, puts out its white flowers above water (mine float). Elodea canadensis is supposed to flower underwater (I have not seen this). Both can grow out of control in ponds lacking herbivores. In most hobbyist ponds with koi and/or goldfish, most gets eaten. I cannot keep any alive with my fish. A site with photos of the two kinds of anacharis side by side that discusses how " Egeria densa " is a "weed" in parts of North America can be found at this site. I find it amusing that they suggest one way to control the non-native anacharis is to use non-native grass carp (who will also harm other native plants and animals). Anyway, try not to let any of your non-native aquarium or pond plants or animals escape to the wild. 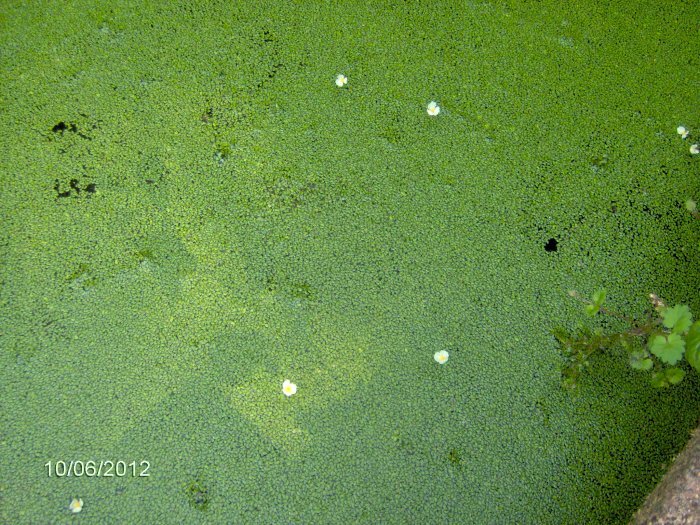 Here is a photo of the two anacharis and similar Hydrilla (water weed) next to each other: comparison. Flowering anacharis in my 153 gallon pond on 5/26/11. 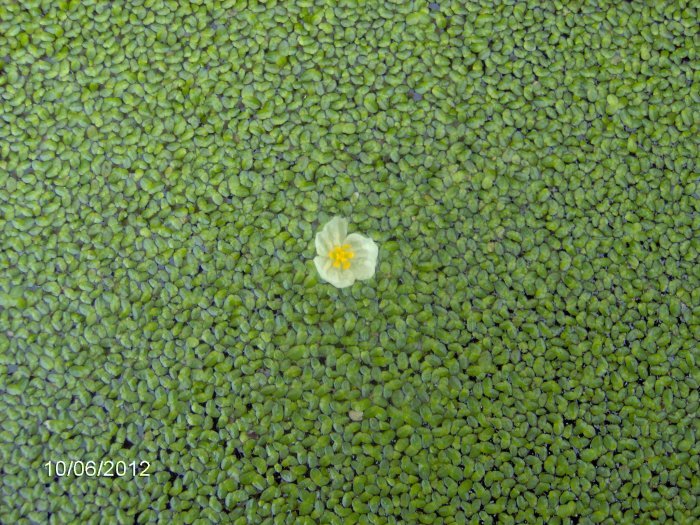 I took these photos of flowering anacharis on 6/10/12 in the 153 gallon pond. The floating plant is duckweed. The flowers are from submerged anacharis which you cannot see.